Recently, I graduated from the University of Michigan, and my husband surprised me with a weekend trip to Mackinac Island! For those of you not from the area, Mackinac Island is an incredible place off the Eastern shores of Lake Michigan/Huron (they’re connected), within sight of the Mackinac Bridge. 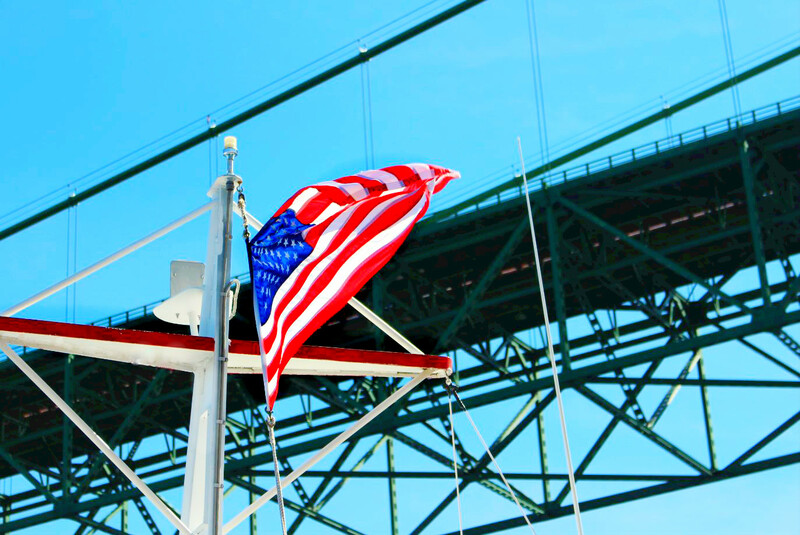 The island has been known as “America’s Summer Place” for more than a century, and while people live there all year long, it is especially popular with discerning travelers and vacationers from around the world. It is also one of the 10 most sustainable places in the world! Cars aren’t allowed on the island, and instead locals and tourists alike get around by bicycles, which is so much fun! Our journey began by taking a ferry over to the island, which is one of the few ways to get there. I prefer taking the Star Line Ferry because they have a “rooster tail” at the back, which means they kick up water behind them as they go! It creates an awesome rainbow effect if you catch the light just right, plus it’s fun to watch! 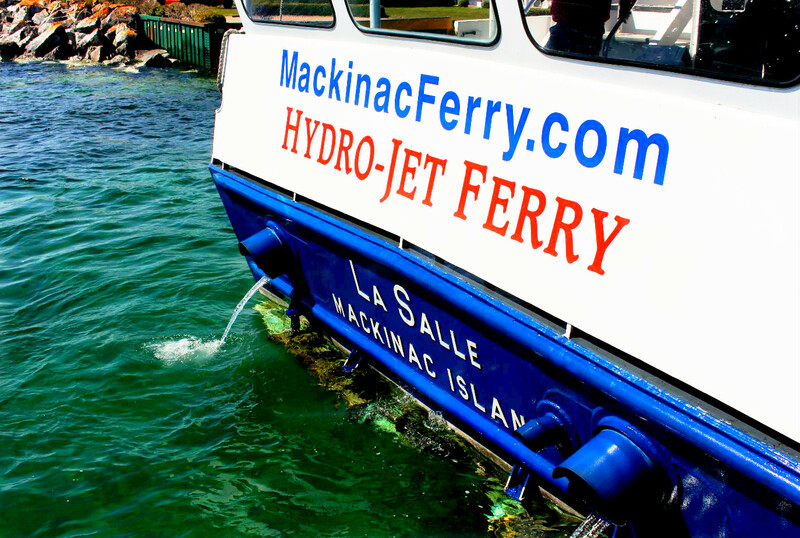 We went on the Mighty Mac tour, which goes under the Mackinac Bridge, and is included in the ferry ride a few times each day (it’s not far out of the way since the island is so close to the bridge). All of the hard work that went into the bridge is just mind-boggling! I’ve lived in Michigan my entire life, and I’ve gone to Mackinac Island at least once a year, every year, and yet the Mackinac Bridge never fails to impress me. At the time of its construction, it was the largest suspension bridge in the world! Normally the ferry boats don’t go this close to bridge, but since it was one of the special times of day where they include it on the trip over! The view under the bridge! Lake Michigan/Huron is just absolutely stunning. The water was a tremendous shade of blue, and the sun was glittering off the water – it was incredible! We arrived on the island with our bikes and luggage and walked them up to the Grand Hotel, where we would be staying for the weekend. A sign informing us of the proper dress code greeted us as we made our way towards the hotel. Since it was just after school had ended, the island was a bit quieter than it was in the middle of summer. Mackinac Island was the perfect place to take a step back from the stress of school and just relax! Our room wasn’t ready quite yet, but they allowed us to store our luggage with the concierge while we explored, which was fine with us! The hotel lobby was so beautiful, I could have spent my time exploring and been perfectly happy! On the ground level of the hotel there is a gift shop, a cafe, several lounge areas, a florist, dining and conference rooms, and so much more. The lamps on the wall were such a cozy addition to the already beautiful ground level! Even if you’re not staying at the hotel, they welcome visitors, for a nominal fee. Of course, you can’t see any of the luxurious guest rooms! There is even a store with art created by Marlee Brown, which adorns nearly every room in the Grand Hotel. She paints incredible sweeping landscapes of island life, island landmarks, the Mackinac Bridge, gardens, lakes, and so much more! We spent quite awhile in her shop chatting with her associate, admiring her work, and picking out the perfect piece to take home! Above is her gorgeous gallery! You can order from her here! I LOVE the splatter painted floor! I love art, and Ms. Brown’s work is even more endearing to me, because not only is it about my home state and our way of life, but we grew up in the same town and we both went to the University of Michigan! We both grew up in Petoskey, we both graduated from U of M, we are both world renowned painters! Okay, maybe I’m exaggerating about the last one, I’m probably not a talented painter haha. After dropping off our bags at the Grand, we decided to go for a bike ride! The island has a road that encircles the entire island, and is one of the most beautiful bike rides in the state! I noticed one of my back tires had gone flat, and this bike shop fixed it for me, in 2 minutes flat! They were awesome! If you don’t want to bring your own bicycle, you can rent one, along with baskets, helmets, and more! The backside of the island is my favorite place! It’s peaceful, and full of evergreen trees, so it’s beautiful any time of year. Can you guess why this place is named arch rock? The views of the lake are simply incredible! There are springs all over the island, a playground for children, parks, soccer fields, and so much more! We circled the island a few times (roughly 8 miles each lap), and headed “home”. The island is home to over 100 horses! Since no cars are permitted on the island, horse drawn-carriage or bicycles are the preferred method of travel. Speaking of horses, we dined at a spot called Seabiscuit Café (racehorse themed, of course! ), and it was spectacular! The suite we stayed in, the Wicker Suite, was incredibly beautiful! I love all of the deep blues and the variety of prints and textures! Each room in the Grand Hotel is uniquely appointed, which means no two of their 390 rooms and suites are identical! Some are even named after people such as Jackie Kennedy, Theodore Roosevelt, or Dorothy Draper! True to its name, nearly all of the furniture in the suite was crafted from wicker! This rug reminded me so much of home! Growing up we always had “rag rugs” like this from a crafter in Petoskey in our mud room, entry way, and laundry room. This little detail made me feel right at home! I just could not get enough of the blues! Somehow I’d coordinated several of my dresses with the decor – fine by me! Even the shower curtain was adorned with the Hotel’s signature logo. Many rooms have a waterfront view, and you can even see the Mackinac Bridge, as seen here from the Laura Bush Suite! Robin had a bouquet sent up to our room, ordered from the lovely florist located in the hotel lobby! The Grand Hotel has thought of everything! The next morning we headed to brunch. The dining room was beautifully adorned with a deep green, one of the hotel’s signature colors! Our meal was delicious, and they had lots of options on their brunch buffet menu, including stuff for vegetarians like us! Another view of the dining room. We were there earlier than most people, because we are early risers! The view from the front porch of the Grand Hotel was our view during our meal! Did you know the Grand Hotel’s porch is the longest in the world? We finished our meal, packed our bags and left them with the valet, and rode around the island all morning, stopping to admire the lake, the scenery, and the gorgeous buildings. We had our bags packed onto a ferry and headed back to the mainland, rested, recharged, and ready to face a new week! The view heading back to the mainland. All photos are my own, please do not use them without my express written permission. All opinions are my own. Thank you so much for reading! Thank you for visiting Grand Hotel and celebrating your graduation with us! Your husband is one of a kind! 🙂 Hope to see you both again soon. Yes he certainly is, thank you! Thank you so much for such a beautiful stay. We plan to be back early next summer, can’t wait!